It’s time for our annual turkey guide & essay. Just in the nick of time, too. Wow! It’s hard to believe that Thanksgiving is just a few days away. Many of you busy planning your Thanksgiving menus. While the sly ones are planning on going to to someone else’s house at letting them cook for you. Smart! Bravo! But if you’re planning on preparing the Thanksgiving feast this year, and you’re going traditional this having turkey, you’ll find this handy holiday guide very helpful – it may even keep you out of the hospital – or at least the bathroom. A turkey is more than a stupid bird that cannot fly very well. Can they fly? Really? Oh well, it matters not, dead turkeys can’t fly at all unless you shoot them from a cannon or throw them. You have to take care of your turkey or it can come back and bite you and I’m not kidding! And it can make your life miserable. I don’t care if it is dead – it can still come back and make your life horrible. Read on and learn why turkeys do not make good pets; even completely dead turkeys take a lot more care than you ever knew. And, this may come as a surprise all you pet lovers: Dead turkeys do not make good pets! Did you know that a dead turkey requires more care than a living cat and almost as much care as a living dog? Cats are pretty good at almost any temperature that people are OK with — whereas dogs are a little more touchy. Dogs seem to do better when it’s cooler. When it’s hot, dogs can get Tired Tongue Syndrome (TTS) and the panting can especially be annoying when you’re trying to watch something on TV. So, if you’re rich – or smart – listen up: Have air conditioning installed! That way, both you and the dog will be more comfortable. Cats seem to be comfortable regardless, so they’re cheaper to maintain. You can have cats even if you’re too poor for AC. I’m very familiar with cats – I’ve been an observer of cats for years and I can tell you that they spend most of their lives sleeping on something soft. This brings me to dead turkeys. Did you know that the most popular kind of turkey is dead turkey? And the most popular kind of dead turkey is a frozen dead turkey? Statistics prove this, but I don’t have those at hand at the moment. If you’re really interested you can google it. Be that as it may, dead turkeys are really quite a lot more trouble than a living cat or even a dog; dead turkeys require a lot more fuss. Cats are pretty good at almost any temperature that people are OK with — whereas dogs are a little more fussy. Dogs seem to do better when it’s cooler. When it’s hot, dogs can get Tired Tongue Syndrome (TTS) and the panting can especially be annoying when you’re trying to watch something on TV. So, if you’re rich – or smart – listen up: Have air conditioning installed! That way, both you and the dog will be more comfortable. Cats seem to be comfortable regardless, so they’re cheaper to maintain. You can have cats even if you’re too poor for AC. I’m very familiar with cats – I’ve been an observer of cats for years and I can tell you that they spend most of their lives sleeping on something soft. Dead turkeys require a lot more fussing than I thought. While cats are quite comfortable and safe between 40 and 140 °F, and dogs are pretty comfy between 40 and 80 °F. However, please remember that anything hotter than that is hard on the dog’s tongue. Dead turkeys have a much more narrow range of acceptable temperatures – and don’t have tongues, that I know of. In fact, my friends, dead turkeys start to become lumpy biohazards at 40 °F. This is something you need to consider carefully unless you live in an igloo or plan on feeding the turkey to your in-laws. I’m just kidding about your in-laws. While cats and dogs can pretty much be kept wherever you have room for them, Turkeys? Not so much. If you’re thinking you’ll just throw your dead turkey in the trunk of your car and forget it… forget it! Gosh… you gotta love the USDA! So, turkey gobblers, forget about keeping your frozen dead turkey on your back porch or tossing it down the basement.stairs. Apparently government (USDA) employees have done this and gotten sick or worse. While cats and dogs may comfortable in the basement or the back porch, don’t you dare put your cat or dog (or turkey) in the trunk! I put that last sentence there for PETA members. I don’t like getting hate mail – it scares me. Despite Ben Franklin’s colonial yearnings and ramblings in his failed attempts to make the turkey the national bird — dead turkeys do not make good pets. Dead turkeys are quite edible and can be quite yummy. If you decide to eat your dead gobbler you must understand this: If you fail to treat it right – it can become a deadly bacterial time bomb. 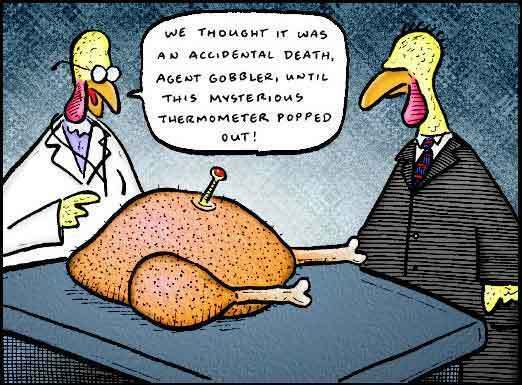 So, in the interest of food safety and in getting dead turkeys off your potential pets list and onto your Thanksgiving menu, here are some tips for you on how to care for your dead frozen turkey so you won’t get sick. These tips, as you might have guessed, are doubly important if you’re planning on serving your any part of your dead turkey to guests. Guests who become sick after eating your dead turkey may not only create a mess in your home, some will become litigious, and may even terminate their friendship with you after their day in court. To keep you healthy and out of court, please follow these nifty USDA guidelines that we have paid our government to publish. So let’s get our money’s worth. Immediately after grocery store checkout, take the frozen turkey home and store it in the freezer. Frozen turkeys should not be left on the back porch, in the car trunk, in the basement, or any place else where temperatures cannot be constantly monitored. Plan ahead: allow approximately 24 hours for each 4 to 5 pounds in a refrigerator set at 40 °F or below. Place the turkey in a container to prevent the juices from dripping on other foods. A thawed turkey can remain in the refrigerator for 1 or 2 days before cooking. Foods thawed in the refrigerator can be refrozen without cooking but there may be some loss of quality. Cold Water Thawing – Allow about 30 minutes per pound. First be sure the turkey is in a leak-proof plastic bag to prevent cross-contamination and to prevent the turkey from absorbing water, resulting in a watery product. Submerge the wrapped turkey in cold tap water. Change the water every 30 minutes until the turkey is thawed. Cook the turkey immediately after it is thawed. A turkey thawed by the cold water method should be cooked immediately. After cooking, meat from the turkey can be refrozen. I kind of like the “Cold Water” method the best. You have more flexibility since you can thaw and store as opposed to the Microwave method which gives your dead turkey hot spots. Heaven knows when I was young I had hot spots! Additionally, the cold water method is clean family fun. I’m sure many wives have recommended the cold water method to their husbands. If your dead turkey weighs 24 pounds, for example, you and your family could have family fun times for up to 12 hours! You can take turns changing the dead turkey’s water. If you have young children, don’t make them try to lift 24 pounds by themselves – it could cause serious injury – which is a danger the USDA didn’t mention, but fortunately I have. Help your kids change the water and make use of those 12 hours as fun quality family time. It’s interesting to note here that dogs and cats do not need their water changed every 30 minutes which is another good reason they make better pets than dead turkeys. The good news is that I’ve never known anyone who has died from eating a dead turkey and you don’t either. I’ve never known anyone who has gotten very ill from eating a dead turkey and you probably don’t either. This means our tax dollars have saved many people from an early grave or from becoming very sick – or that turkey-dangers are overblown. On the other hand, I have known lots of people who have gotten sleepy from eating dead turkey and ended up lying all over my house, snoring, making it almost impossible to get them out of my house and make them go home. However unwanted my guests were, none of them every died from eating my dead turkey, and very few, if any, got sick. So I’m really not sure how dangerous bacteria-laden dead turkey is, because, truth be known, you and I and all us humans are walking bacteria factories. Inside our body cavities we have more harmful bacteria than any dead turkey you’re every likely to see. I could tell you more, but… well, I’m not going there. 1. Chase the dog out of the kitchen – or put him in the basement. Dogs love turkey and you don’t want your dog messing with your bird. 2. Chase your cat out of the kitchen. Cats LOVE turkey and they’ll pester you until you give them a hunk. Don’t give them any. You’ll spoil them and they will never again eat crunchy Meow Mix. Put your cat in the garage until the turkey is safely roasting in your oven – on its final journey, so to speak. Sorry. I’m out of time. I’ll get into stuffing safety next time. Feel free to print these timely – maybe even life-saving tips! And feel free to share this engrossing article with family and friends. The turkey you save may be your own. i did not read it all, not finding it funny. I never cease to be amazed at the essays you write. The variety of topics, the depth of some, the whimsy of others, but the creativity is amazing. Never in a million years could I have come up with all of the ins and outs of Caring for a Dead Turkey. I’m curious as to the amount of time it took to put this essay, for example, together. You make my day. …..there are 18 turkeys running around our neighborhood at this very moment. If only they could read.